Basalt's Aaron Lopez, right, tries to control the ball against Vail Mountain School on Friday, Oct. 12, 2018, in Basalt. (Photo by Austin Colbert/The Aspen Times). Three days after knocking off No. 3 Roaring Fork, Basalt High School boys soccer coach Brent Hayes simply wanted his team to avoid a letdown against visiting Vail Mountain on Friday. While it wasn’t always pretty, the Longhorns did enough to hold on for a 2-1 win over the 9th-ranked Gore Rangers in Basalt. The game had originally been scheduled for Thursday but was pushed back a day because of weather. Basalt trailed 1-0 against Vail Mountain, and it took a goal from Gaby Bonilla in the final minutes of the first half to make it 1-1 at the midway point. 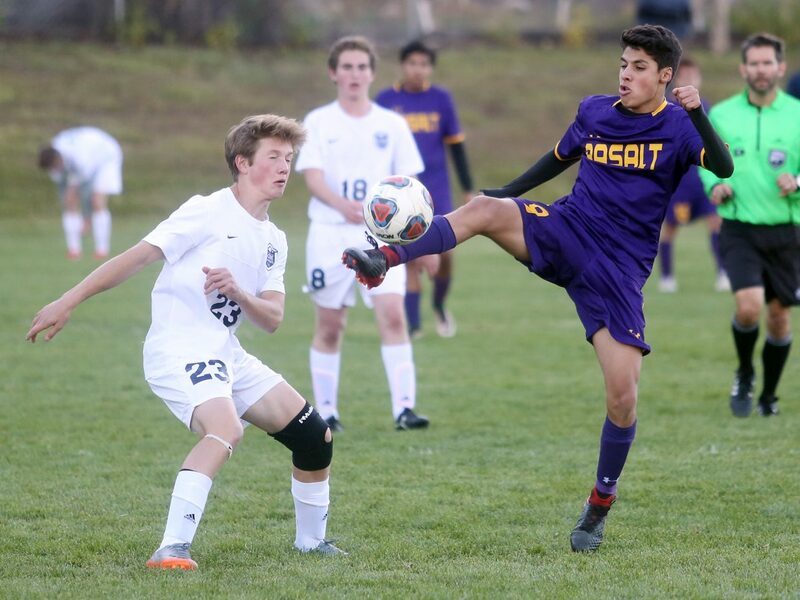 The Longhorns were awarded a free kick about eight minutes into the second half when the VMS goalie grabbed the ball off a direct pass, which isn’t allowed, and Aaron Lopez made the most if it, his goal making it 2-1 in favor of Basalt. The Rangers had plenty of chances late in the contest, including a shot that bounced off the left post only a second before the referees blew the final whistle to end the game. Unranked Basalt improved to 7-7 overall with the win and 5-1 in 3A Western Slope League play. They are tied atop the WSL with Coal Ridge and Roaring Fork with a league loss each, although the Longhorns hold the tiebreaker against both schools. BHS has only one regular-season game remaining, a trip to Delta late next week with the outright league title on the line.